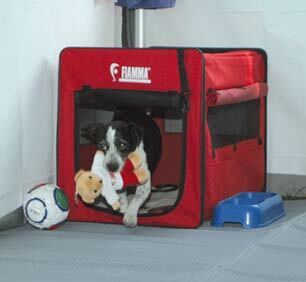 New Fiamma dog house for your pets comfort. 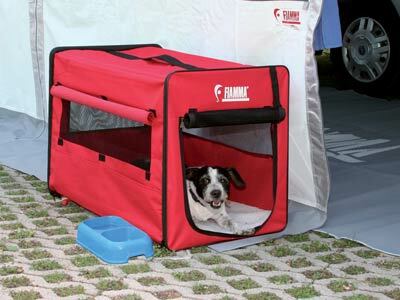 Fiamma Dog House is made from strong waterproof resin polyester. Large side windows with moskito net, which can be rolled up to provide maximum ventialtion. 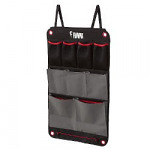 The front panel has an opening zip. 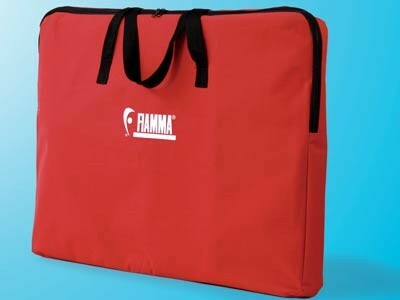 Can be used inside your motorhome, garage or Fiamma Privacy Room. When closed takes very little space and is standard delivered with sensible carry-bag, carpet and eyelets to fasten it to the ground. Dimensions open: 75 x 49 x 55 (H) cm. Dimensions open: 78 x 55 x 3 (H) cm. Fabric: Strong waterproof resin polyester.